All ME.FAN products are offered UNDER REGISTERED TRADEMARK and ONLY SOLD BY ME.FAN. We do not authorize any other sellers to sell our products on Amazon. We can not guarantee products quality of other sellers! Why choose ME.FAN Multi-Use Carving Trivet Mat? ----- 100% Food Grade Silicone Material ensure that won't absorb odor, mildew, stain, rust, crack or chip. ----- BPA free and FDA approved. Nontoxic and environmental trivets will be better keep your family and friends health. ----- Heat resistant up to 482 degree Fahrenheit, Can be used to protect your counter top, chicken tables from all hot things. ----- As a Mat, they can be used as kitchen mats, table mats, bowl mats, dish mats and pitcher coasters. As a trivet, they will product all kitchen surface. ----- 3 Different Unique and Beautiful Carving-Shaped decorate your kitchen and home. ----- Wash it with your hands or throw it into the dishwasher. Guarantee 30-day money back, Lifetime services. ☆ The soft and flexible silicone trivets can be used as a trivet to protect your kitchen surface from all scalding dishware. The unique yet practical and durable trivets are also suitable for kitchen mats, table mats, bowl mats, dish mats and pitcher coasters. ☆ The large size: 20*0.6cm/7 3/4'' * 1/4'' ; Extreme temperatures range from -40°F to 482°F; And the 3 kinds of carving-shaped kitchen components add style and function to your home. ☆ Easy to Clean and Store: Simply wash it with your hands or throw it into the dishwasher when it need to be cleaned; The flake is designed for easy overlaying and the hole for easy hanging and convenient storage when not in use. 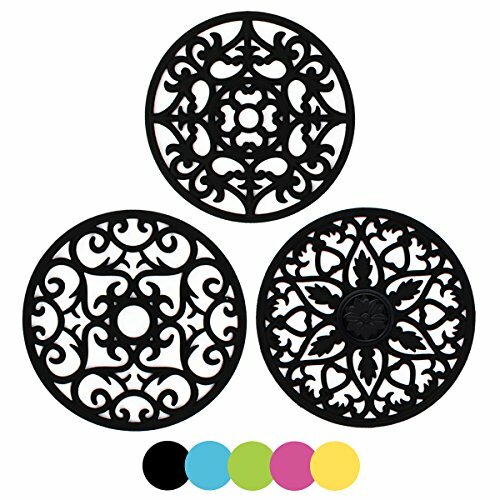 ☆ Warranty and Services: All trivets ship fast from Amazon warehouses. Feel free to contact us if you have any questions. We will provide the best service for you, with a 30-day money back guarantee. All ME&FAN products are offered UNDER REGISTERED TRADEMARK and ONLY SOLD BY ME.FAN. We do not authorize any other sellers to sell our products on Amazon. We can not guarantee products quality of other sellers! If you have any questions about this product by ME.FAN, contact us by completing and submitting the form below. If you are looking for a specif part number, please include it with your message.